As mentioned in previous posts, one of my weaknesses lies in beautiful cake stands. I can hardly pass one up, no matter what the appearance. I think of ways to change it if perhaps it is old and in shabby condition. 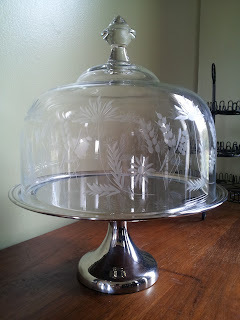 Besides DIY projects, I also think of how I can actually utilize my cake plates in my kitchen and in other rooms so that they don't just sit there, naked and cakeless. This beautiful stand and dome actually does not belong together, but you see how the stainless steel and the etched crystal work together? The cake stand was sold to me on Craiglist for $10 and the dome I picked up at a yard sale for 50 cents. It has one teeny tiny chip at the bottom, which does not bother me. Plus the dome itself is very tall and allows me to cover 4 layer cakes with no problem. Collecting cake plates and stands does raise a storage issue. Right now I have approximately 12 cake stands sitting on top of my kitchen cabinets, as well as 4 on top of my refrigerator. I have 2 in my china cabinet and 2 stands on my hope chest, pictured above. There's a vintage stainless steel cake carrier on my counter, which I use to hide electronic gadgets such as hand-held recorders, chargers, and other small gadgets. It looks great on the counter and is totally utilized for storage. I also have a few fake cakes under domes. Whenever I see a dome, I pick it up. Cheese domes are good to cover one cupcake. Imagine how pretty a dessert table would be with 4-5 little cheese domes covering individual cupcakes to serve to guests! I haven't done this yet but hope more domes next yard sale season. What do you do with your cake plates and stands besides the obvious?